We're getting a bit burnt out and tired of sightseeing and traveling. Again. It's been about a month of riding around Central Europe and we've seen a lot of stuff, I think we need to take a breather as well as take some time to digest everything. Over the last three years, we've met a lot of fellow travelers and a lot of them live in Germany, so what we've planned for the next week or so is just hop around the country and visit all of our Deutsche freunde who we haven't seen in a while. On the way there, we booked an AirBnb place in Slany in the Czech Republic with the intention of riding into Prague (about 45 minutes away) to see the city, but everyday we found an excuse just to be lazy. Travel fatigue has set in big-time. I don't think we would have appreciated it, so we'll leave it for another time. 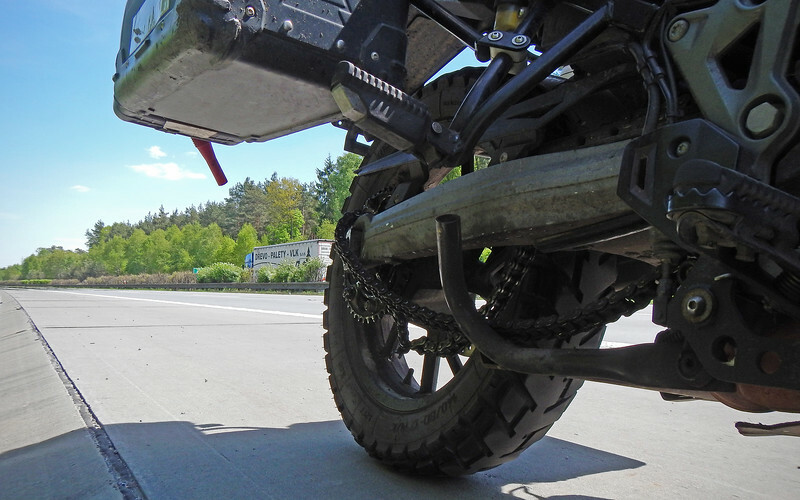 When our booking ran out, we hopped on our bikes and headed west on the highway towards Germany. Happy times somewhere in the Czech Republic. Leaving Slany on the way to Germany. It's another nice riding day, and we were doing good mileage so far. But then about 50 kms away from the border, I notice Neda's bike in my mirror slowing down. I tap on the communicator and she yells, "I think my chain broke!" Her bike is rapidly disappearing in my mirrors so with my four-ways on, I pull over as quickly as I can to the side of the highway. Neda pulls in the clutch and manages to maintain enough inertia to coast to a stop behind me. 1. I feel very responsible for this. 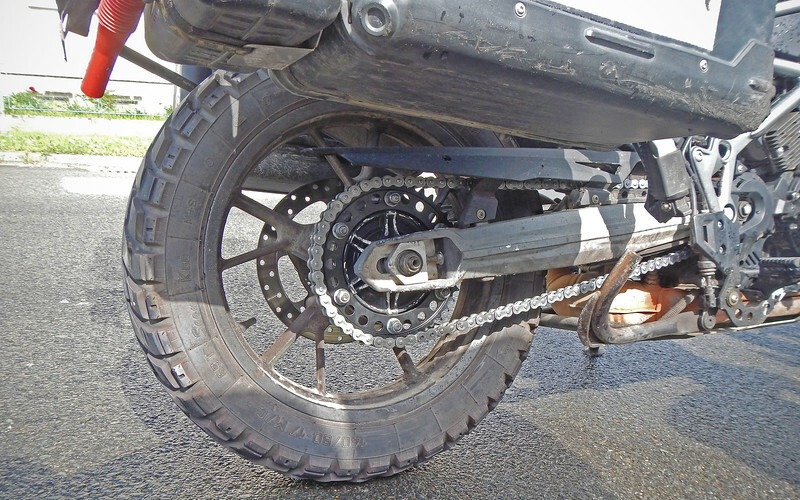 At our the last service in Belgium, we had neglected to put on a new chain because I wanted to save money and I thought this chain would last a few thousand kms more. I was wrong and now this would cost time + money. Ever since coming to Europe, everything is so expensive here (compared to Latin America where we came from) and I've become frugal to the point of irrationality. The bikes are not just the main mode of transportation for this trip, they *are the reason* for the trip and should have been the #1 priority regardless of cost and I forgot this fact. 2. We need to start cancelling appointments. 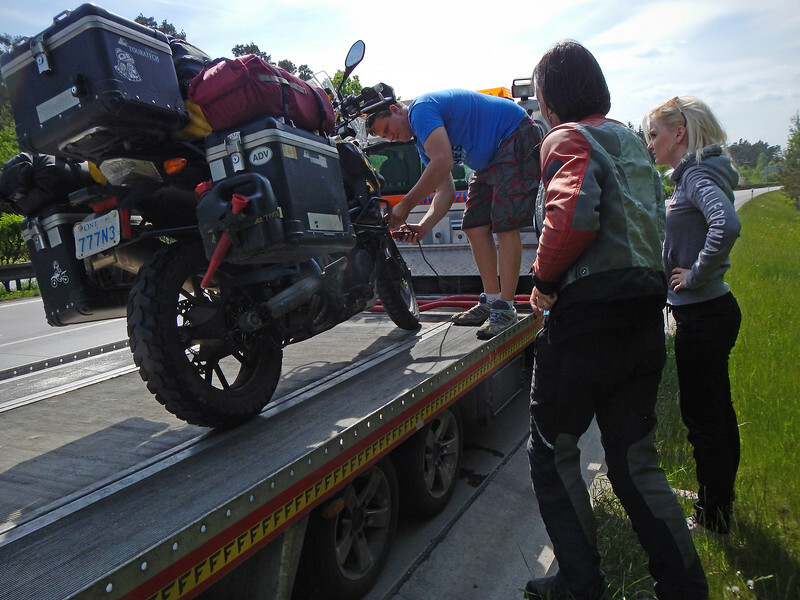 We were going to meet Colleen and Dan in Germany tomorrow as they were riding back from a motorcycle meet and we could intercept them on their way back home to Switzerland. Obviously we're not going to make it. 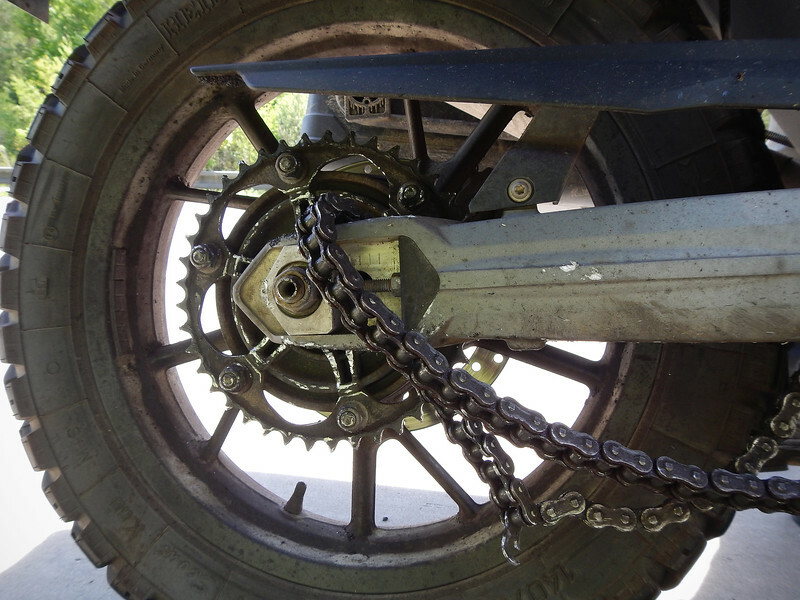 Depending on how quickly we can get a new chain for Neda's bike, we might or might not be able to see some of our other friends later on. So here we are, one bike stranded on the highway between towns, 18-wheelers are moving over to the passing lane to give us room on the narrow shoulder while we figure out our next move. 4. But I was stubborn because I really liked my Big Pig. So there was no other option. I hopped on my bike and rode on down the highway to find the next town and look for help. I punched in "Closest Auto Services" on my GPS knowing that they probably didn't service motorcycles, but they could probably tell me where I could find a moto shop. 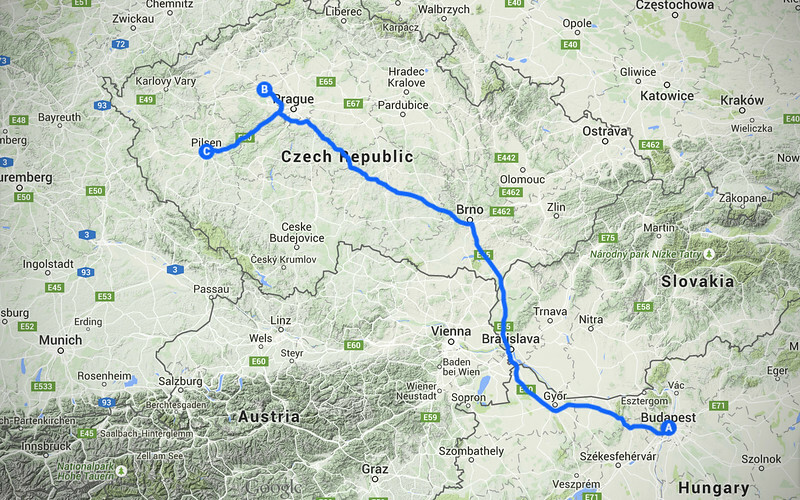 The GPS led me to the town of Nýřany, just a couple of kms down the highway. I navigate through the quiet streets of this small Czech town and end up at the locked gates of the auto shop. They looked to be closed on Saturdays. Now what? I looked around to try to find some help. In the driveway at the house next door to the auto shop, an older gentleman was getting off his scooter and walking to his front door. I rode up to him to ask for assistance. "Do you speak English? ", he shook his head in reply. Ugh. I don't know what to do. I consider thanking him and taking off to find someone else to help us, but the man kindly told me to wait as he went inside his house. A few moments later, he came out with his wife. She didn't speak English at all either. Oh how I wished Neda was here! But his wife did call up their daughter on the phone. She lived in Prague but *she* spoke English. So I explained to her what our situation was. She relayed this information to her parents and they looked up the number for the local tow truck so they could call one for us. I thanked her daughter on the phone and let her go. Her parents dialed the tow truck company for me and over the phone I gave them Neda's GPS location, but they also wanted a cell phone number to guarantee that someone would be there at the co-ordinates and not stiff them. I didn't have a SIM chip (see #3 above). The Czech couple graciously gave the tow truck people their own phone number, trusting that this stranger wouldn't leave them hanging for the bill. I had been in their driveway for over 45 minutes at that point and I don't how it happened, but I suddenly realized that I was speaking to them using what little Croatian I picked up overhearing Neda talk to her family and friends over all these years. Maybe it was the charades and sign language as well, but I was able to communicate well enough to them, *and* I understood some Czech words as they spoke to me. I was so excited! Neda would have been so proud of me if she were there! I thanked them profusely and jumped on the bike to wait for the tow truck with Neda. 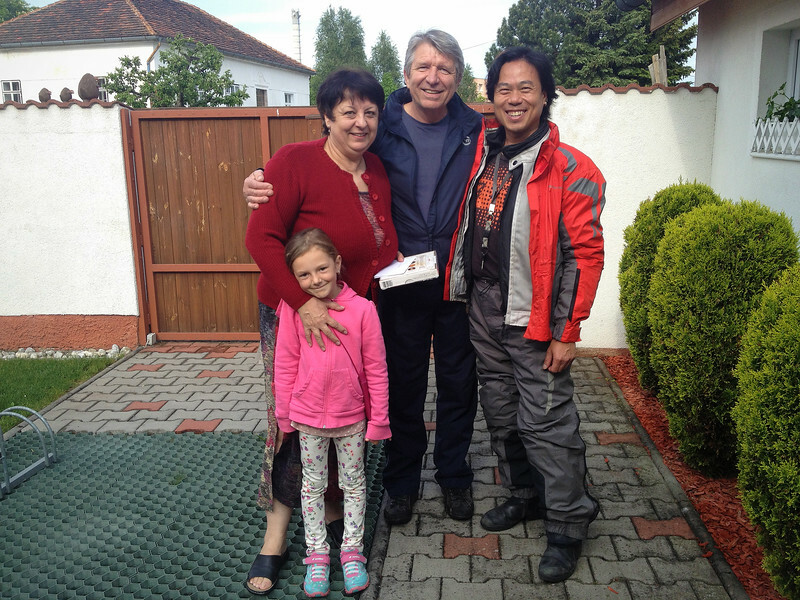 I could not get over how friendly, helpful and trusting this Czech couple were. I felt so much gratitude! 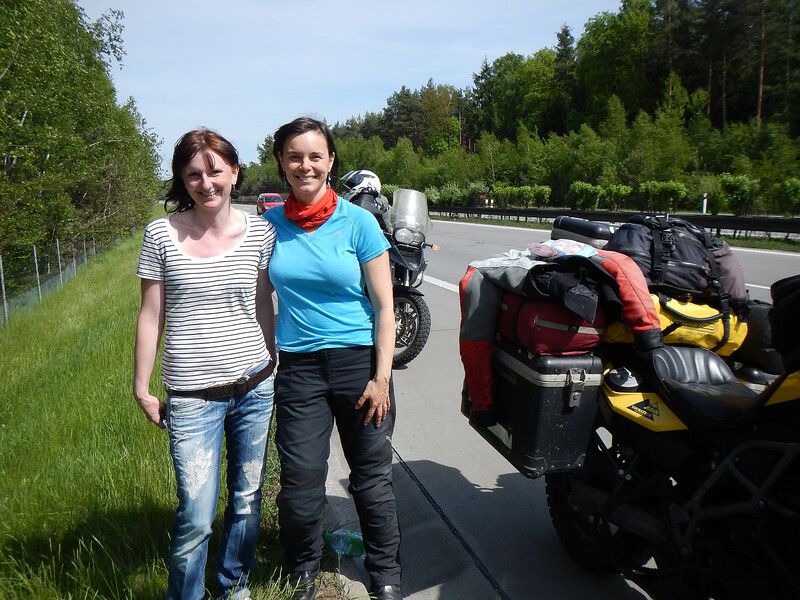 Lenka also rides motorcycles (same model as Neda's bike) and when she saw her stranded on the side of the highway, she stopped to see if she could help. She lived pretty far away, but told us that she could get her trailer and come back to give us a tow. Wow, that was so gracious of her, but I told her we had already called for one. She then offered us a place to stay if we were passing by her place, but unfortunately we were not going that way. We took down her information in case we were going to be around here again, which we just might in the future. It would have been fun talking bikes and travel with her. She was *sooooo* nice! Based on all the Czech people I've met so far, they must all be the nicest people on Earth! All of them!!! Not long after Lenka left the tow truck came and proceeded to put Neda's bike on the bed. We communicated mainly to the driver's girlfriend who spoke English and acted as a translator. They asked us where we wanted to take the bike. Lenka had told us that she used to get her BMW motorcycle serviced in Pilsen, about 15 kms away from us, so that's where we decided to go, Neda in the truck and me following behind them on my bike. We got to the BMW dealership and it was already closed, but peering through the window I noticed no motorcycles on the showroom floor. After a bit of checking, we found out that they stopped selling and servicing motorcycles recently. Now what were we going to do? Our tow truck driver told us that he had a friend in a neighbouring town who was a motorcycle mechanic and that he was open on Saturdays. That sounded good to us, so off we went. The town was almost back to the spot where Neda broke down. There were a whole lot of bikes in the mechanic's lot but he told us that as soon as he ordered the parts and received them, he would start working on Neda's bike. Cool. But he said he could only order the parts on Monday, and they would probably arrive on Tuesday morning, which would be the earliest he could work on them. Well, that meant we would need to cancel our plans with our German friends. Our tow truck driver helped us find a budget hotel back in Pilsen and even drove Neda back to the city. They did *A LOT* of driving for us that day. In addition, they arranged for the mechanic to pick her up on Tuesday. And the total charge for all this towing, chauffeuring and organizing for the day: €30! I know how much gas costs and the mileage they did the whole day plus the time they spent working on all of this, it was obvious they were giving us a *huge* discount. Neda told me later that she bonded with the tow truck driver's girlfriend while in the truck, so I think they felt bad for us and wanted to help out. Confirmed: Czech people *are* the nicest people on Earth! We were back on the road! Whohoo! But first, I wanted to thank the Czech couple who helped us call the tow truck, so we bought them a gift and rode back to their house to properly show our gratitude. And also Neda got a chance to meet these nice people. Děkuji!!! Josef & Ivana and their grand-daughter. You know, although it made our lives a bit more complicated for these past few days, sometimes it's these small setbacks that pull you out of a routine (even if that routine is riding motorcycles around the world), and expose you to the kindness of strangers, who despite not sharing a common language, still want to do everything in their power to help you out.